I remember some time ago when developers claimed that it was time for new tech to be presented if the public wanted better, fresher, and more unique experiences. With the PS4 and Xbox One around the corner, I could almost hear the entire gaming world collectively lick their lips with anticipation from the promises of all the incredible games that would finally be capable of being made. Fresh ideas were being announced out of the woodwork, and games like The Order: 1886 were to dominate publicity over games like Call of Duty. 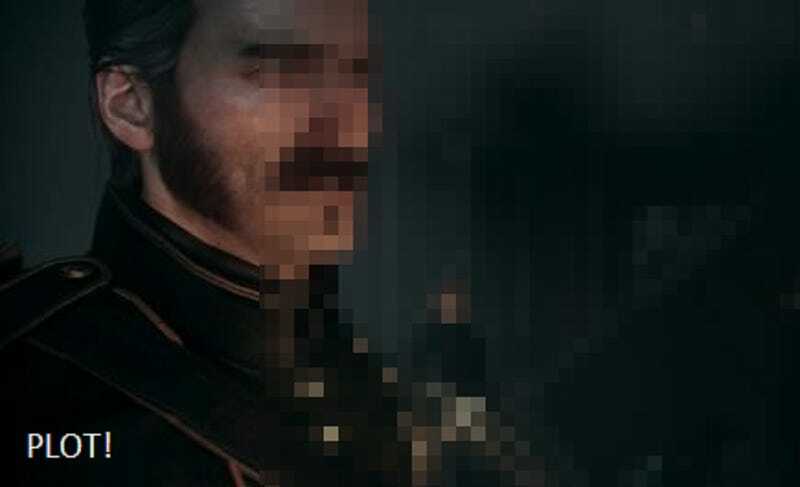 When they were announced, so little was known, so many secrets were kept about what the actual game was, and apart from being revealed that it was a cover based shooter, still less is revealed about the idea of what defines The Order: 1886. If that sounds familiar, that's because we just went full circle as to what was meant to define this generation of games. At the end of the PS3 and Xbox 360 lifespan, game companies were struggling so much to provide the best graphical fidelity they can squeeze out of the consoles, all the while the PC Master Race was sitting comfortably chugging out 60 FPS on any high definition game that was even remotely optimized for the PC. After dishing out sequels and ripoffs of other games with the promise of higher graphics, gamers began to wonder why there hasn't been any new attempt at trying anything even remotely original, and forget about the graphics. The answer devs gave? They needed new tech. And now that the tech is out, what are the companies saying they're putting all those resources towards? Better graphics. The Order: 1886 is hardly the first game to try to stand out as unique on visuals alone, and it is hardly the first game to word its promotion as if there's more going on than just visual fidelity, but the latest interview with Ready at Dawn games regarding their Victorian-era "Gentlemen of War" (as some affectionately and appropriately call it) is a prime example of this, so if it sounds like I'm singling out Ready at Dawn, that's only because they're the most convenient target. To better explain what it is I'm getting at, let's take a look at the article, itself. Throughout most of the article, Ready at Dawn talks about improving story and character design in this generation, a commendable approach indeed, given how most characters in modern day first person shooters are so void of personality and identity that they would actually exude personality if their faces weren't rendered. Characters like Sam Fisher, Frank Woods, and many who fit a similar category are such boring, one-note military goons that even if I tried my damnest, I could not bring myself to like (read: not hate) them. Any shred of humanity or character design being put into a character in a shooting game would be a welcome sign, indeed. But it's the way that Ready at Dawn hopes to accomplish this which is really disappointing. "Next-gen is kind of letting us go and do humans in a way we feel is like...I don't look at them and just go, 'Oh, that looks like an old Final Fantasy plastic mannequin face.' It's like, 'Sure, he's not perfect,' but I listen to them talk and I see everything go on nuanced in the face and I go, 'Oh, that's a good performance.' I'm even starting to see the actors that we cast come through in the faces and stuff because we actually get their personality. I think that's going to be something that next-gen lets us really tap into." What is basically being said here is that the personality and character cannot be conveyed properly due to a lack of graphic fidelity. In some sense, it's partially true. An actor is defined not by showing as much emotion as possible, but conveying emotion in the tiniest facial details. The problem is, though, in creating such a detailed rendering, you're really only defining the actor, not the character. Despite what it may seem, the two are, in fact, mutually exclusive. How many times have we seen a great character butchered by a mediocre actor when performed by somebody else? And in reverse, how many times have we seen a great actor get a crappy role that just can't be done well? Trauma Center: New Blood was criticized for solid voice acting being wasted on terrible dialogue (which is one fundamental aspect of defining a character). Even then, a majority of the games which many of us played with incredible characters had no actors, sometimes not even at least a voice actor. I've only recently got into Persona 4 (don't judge me, I'm not too big on RPGs) and each character won me over in the second line of dialogue. Certainly, the incredibly good English voice acting was a big push in that direction, but Persona 4 didn't have any facial animation or motion capture. Heck, not even the hand-drawn faces moved (like in Phoenix Wright), and I connected with these digital people on a deep level simply because they exuded character. Going back a little further before voice acting, I'm sure many of you would recall Final Fantasy VI, a 2D sprite game which delivers the entirety of the story through text, but I'm more inclined to use Square's first genuine iPhone RPG, Chaos Rings, as an example of how you can have complex, lovable characters which convey and evoke emotion in equally high doses. Some may argue that all those examples are RPGs, and cannot be compared to the same storytelling style of a fast-paced shooting game, but I would be swift to point out Call of Juarez: Gunslinger, a game which presented a great cast of memorable characters with fantastic dialogue. The ramblings of old man Silas Greaves and his less-than-impressed audience for his tall tales was easily some of the most engaging storytelling I ever sat through in a first-person shooter. But Gunslinger didn't just lack motion capture and facial recognition, or high polygon count and particle effects. It lacked cutscenes. The entire story was fed to you as you played, never once laying eyes on the members of the bar where Silas Greaves sat outside of intro/ending sequences where all that was "rendered" of the character models were 2D hand-drawn pictures. And even then, those moments in game where these characters weren't seen greatly illuminated their personalities, completely outshining those moments where they just sit in a bar and talk. Ready at Dawn was right to put L.A. Noir as an example of how graphics could influence storytelling, but that's because the graphics were, in itself, a game mechanic, not a storytelling device. For example, in L.A. Noir, you had to solve crimes by determining who was lying and when they were doing so by the minute inconsistencies in their facial expression. It was as much a cutscene as it was actual gameplay, and it was a genuinely innovative, if not entirely revolutionary, idea. An idea that worked, that provided a new and fresh experience in an oversaturated genre. However, from all the interviews and examples that we have heard not just for The Order: 1886, but for various other games which came out (and are coming out on the horizon), no such innovation has been announced to be in the game from the increased processing power of the two new console boxes. The key difference between those new games and L.A. Noir is that L.A. Noir is a last-generation video game, which in addition to the dual-rendering (which has been possible since the Source engine) debacle of Call of Duty: Ghosts makes me wonder if any of these people touting graphics even know what they're really talking about half the time. Again, I'm not inclined to believe that Ready at Dawn is actively manipulating its audience, but it is phrasing a lot of its interviews to sound like it's promoting multiple aspects of the game using next-gen hardware, but really, it all boils down to a single thing, and that single thing is, again, graphic fidelity. To present movie-quality cutscenes and in-game graphic detail rendering. The Order: 1886 isn't even released yet, but given how little we actually know about the title other than it being a third-person shooter, and of course, the graphics, we know very little about what kind of gameplay it actually offers in the grand scheme of things. Sure, we saw some scenes, but it's definitely disconcerting that hardly ever is the actual gameplay ever mentioned, no talk of AI, no talk of new features aside from differently scripted events, and no talk about game modes, or maybe co-op play, or online interaction, what kind of replay value we can expect. No talk of human interaction between the player and the world, no branching stories, no revelation regarding freedom of approach. For all we know, when the game comes out, it could be the most innovative experience since the original Deus Ex, but given how little the gameplay aspect is being touted by its own devs (scary little, as a matter of fact), it could very well be the most boring, "cinematic," formulaic game I've ever played since Uncharted (excluding the multiplayer, that $#!t was fun). What do you guys think? Is the next generation of console's power being wasted on graphics alone? Are devs just blowing smoke out of their rears?